DUBBED: British marine scientists found a hexapus in a lobster pot off the coast of North Wales in 2008. When his keepers at the Blackpool Sea Life Centre noticed he was special, they named the creature "Henry" after King Henry VIII (1491-1547), who had 6 wives. An aquarium spokeswoman stated, "It's a lovely little thing." But Henry should no doubt be spoken of in the past tense, since by now he has lived out his short life and died a natural death. CLUBBED: Mechanical engineer Labros Hydras from Washington, D.C., was snorkeling in Greece with his family when he caught a hexapus and smashed it against a rock to serve up for dinner. Only after it was fried and eaten – with tomato and lemon – did he realize what a rarity he had consumed. "It tasted just like a normal octopus but now I feel really bad." 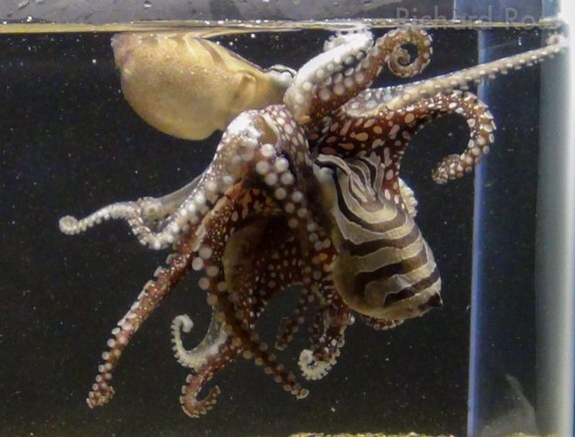 Rather than show you a picture of the unusual animal on a plate (IMAGE HERE), I offer you a photo of the Larger Pacific Striped Octopus, which mates by "kissing," and made its public debut in March of this year.